The new Single-Cell RNA-Seq System has been developed for efficient, high-throughput, single cell transcriptomics. This compact, scalable system enables rapid, reproducible droplet encapsulation of individual cells, allowing up to 10,000 single cell libraries to be generated in one 15-minute run. The Single-Cell RNA-Seq System allows up to 500 µL samples of cells and oligo-barcoded beads to be encapsulated in monodisperse droplets, each containing a single cell. 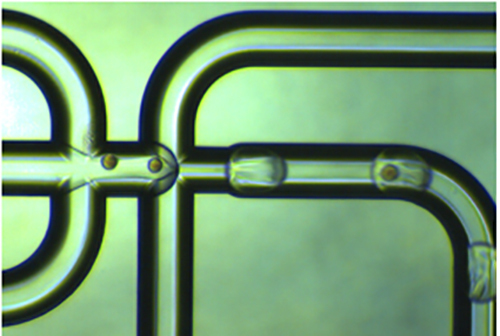 The system uses a glass Single Cell RNA-Seq Chip—a commercially available version of the prototype PDMS Dropseq chip, offering faster run time, longer life, and greater ease of use. Following encapsulation, the cell is lysed, allowing the mRNA to be captured on the beads for downstream recovery and sequencing.